Show off your videos on your own site. 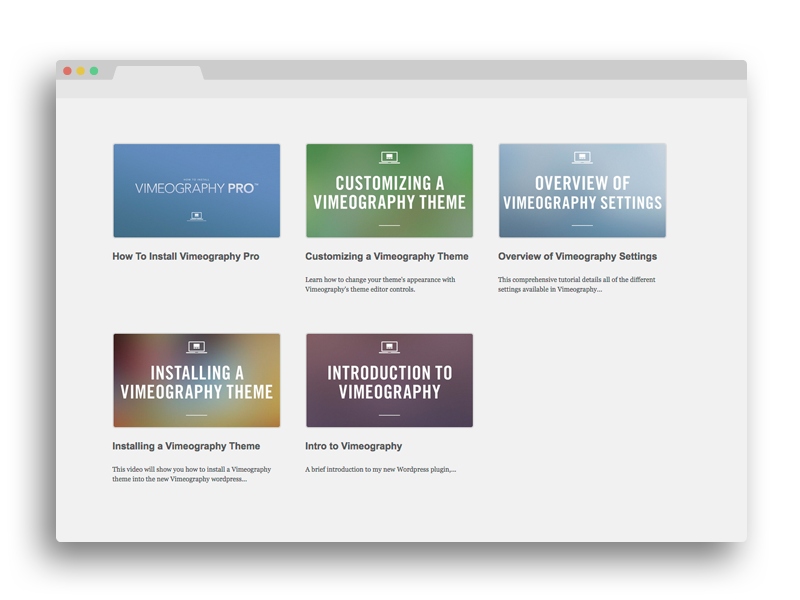 Vimeography is a WordPress video gallery plugin that displays your Vimeo videos in a beautiful and modern design. Perfect for your membership site, portfolio, online course, reel, or any other video collection. Enter your Vimeo username below to see how your videos would look using our plugin. Modern video gallery designs for your portfolio or membership site. Vimeography has a variety of designs available so that you can find the one that fits your site perfectly. Every time you upload a new video to your Vimeo account, it will automatically appear in your video gallery. Customize the design of your galleries so that they match the way your site already looks – all without writing a single line of code. Add search, allow downloads, sort your videos and more. Vimeography Pro adds even more features and controls to get the most out of the video galleries that you create. Plenty of resources to get you up and running. Watch the tutorial videos to learn how to best use the plugin, or read up with our complete user guide and FAQ. This plugin is an absolute gem! There is not an easier and more beautiful way to integrate your favorite Vimeo videos and showcase them on your website. Stop looking and download this plugin. I've tested close to every media / video gallery plugin and nothing is as clean and elegant as Vimeography out of the box. Great tutorials that explain how to set it up and understand the options... takes 10 minutes to learn if you don't know what you are doing. I tried lots of other plugins before I bought this one, and it is by far the best. Beautiful. Easy to use. And the best part? Tech support is quick and reliable! View over 75+ more 5-star reviews!